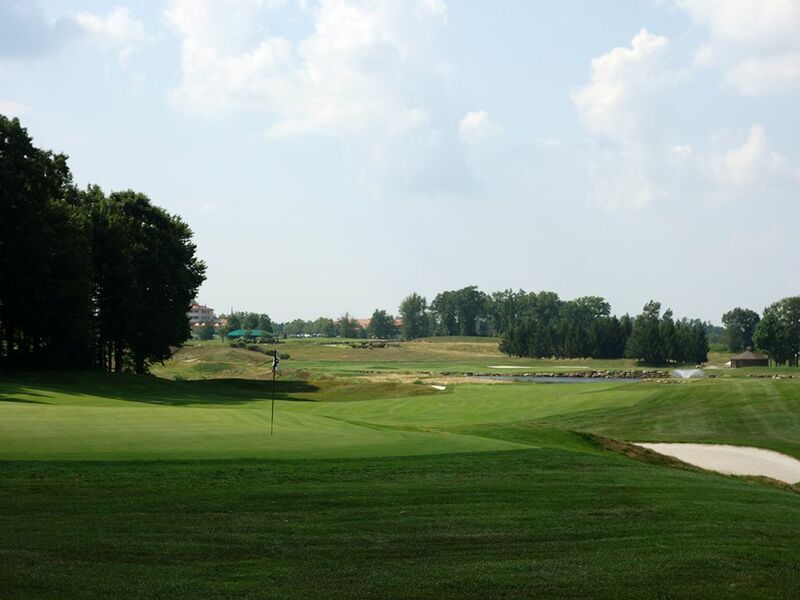 Course Website: Official Website - Visit Mystic Rock at Nemacolin Woodlands Resort's official website by clicking on the link provided. 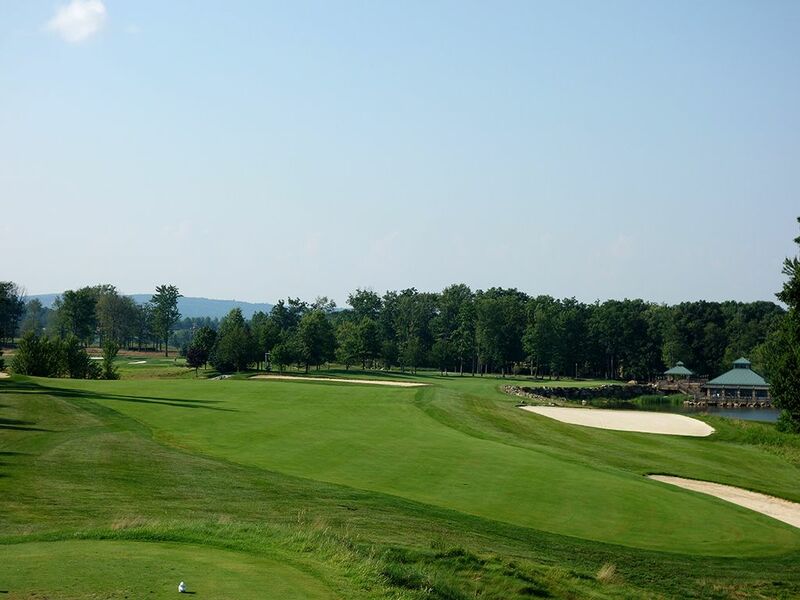 Accolades: Ranked 8th in Pennsylvania on Golf Course Gurus' Best in State list. 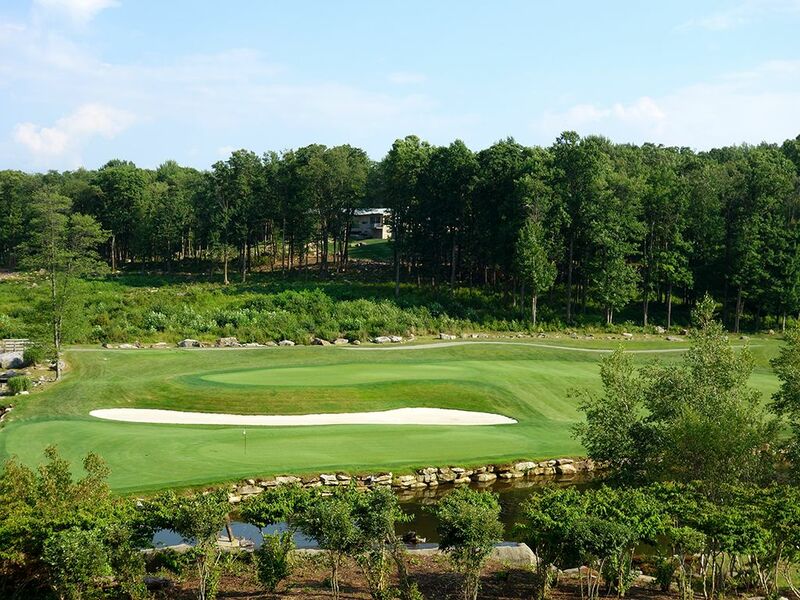 What to Expect: Mystic Rock was built in 1995 on the 2,000 acre Nemacolin Woodlands Resort that Joseph Hardy III purchased in 1987 and turned into a AAA Five Diamond resort hotel. Located 70 miles south of Pittsburgh, the resort is an impressive spread with five lodging options totaling 322 rooms, a luxurious spa with 40 treatment rooms, five swimming pools, 15 dining options, a casino, a multimillion dollar art collection, a plethora of outdoor activities ranging from tennis, to shuffleboard, to mountain biking, to rock climbing, to paintball, to shooting and archery - let alone 36 holes of great golf. 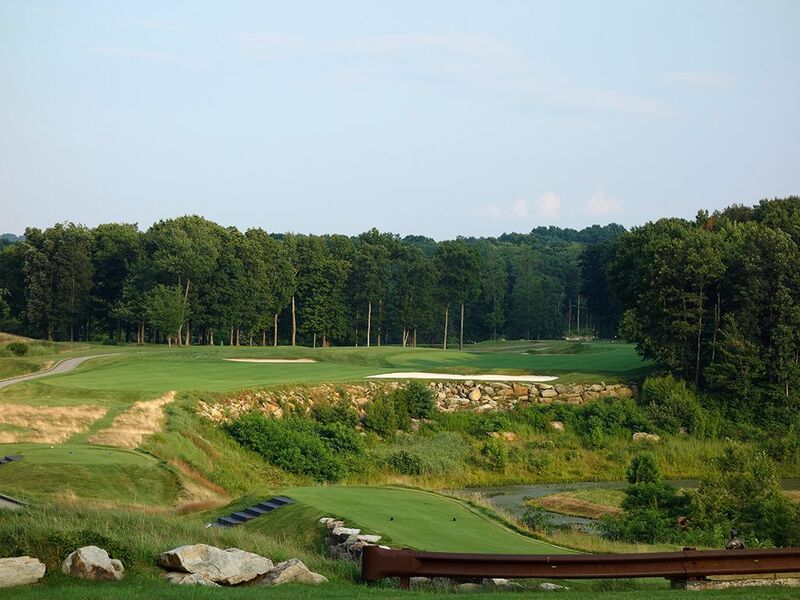 The former home of the 84 Lumber Classic PGA Tour event, Mystic Rock can stretch out over 7500 yards and stand as one of the most challenging courses in the country with a 77.0 rating. 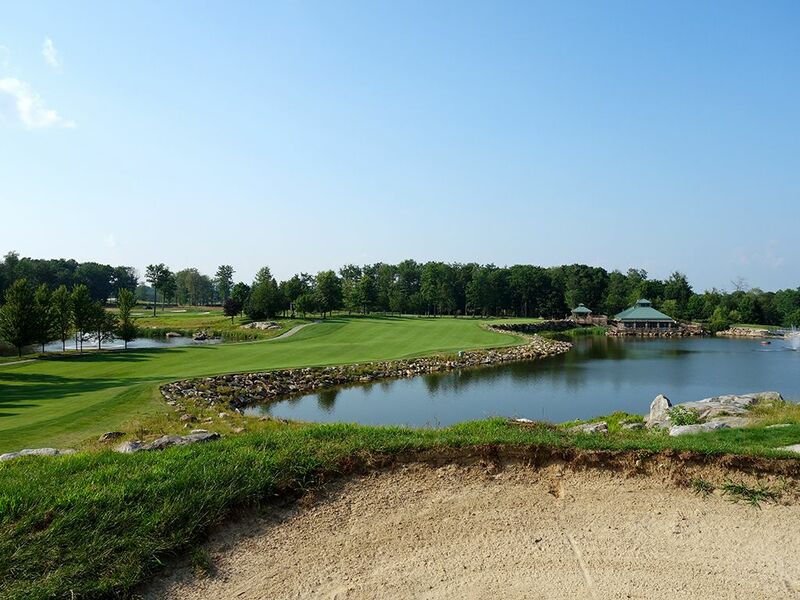 The course is partially a golf experience and partially a visual and art experience as Mystic Rock has a large waterfall next to the 5th green, rocks creating retaining walls for fairways and water features, and multiple statues on display including Vijay Singh, Gene Sarazen, and John Daly among others. 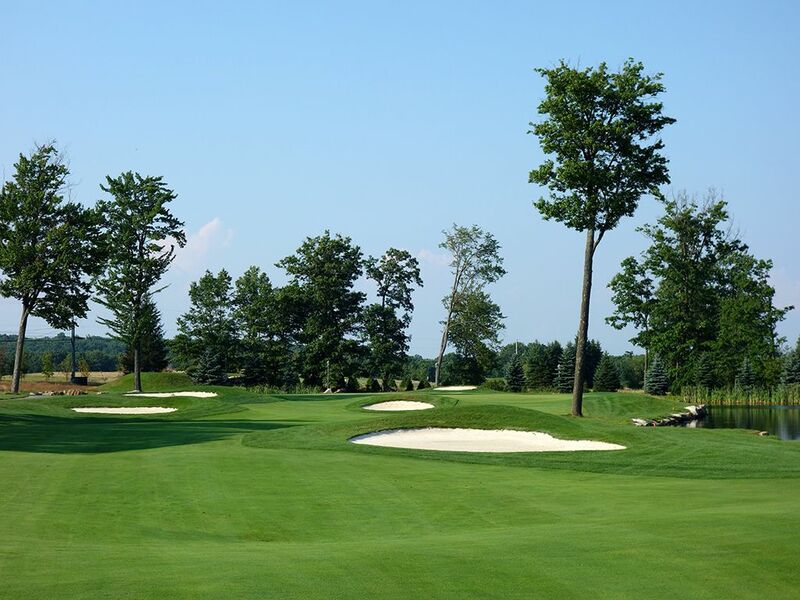 While the course is challenging, selecting the appropriate tees for your skill level makes all the difference in the world since the fairways and greens are relatively generous and certainly easier to handle than many diabolical Pete Dye designs. The result is a great blend that makes a course tough enough to host the best players in the world while still catering to the traditional resort player. 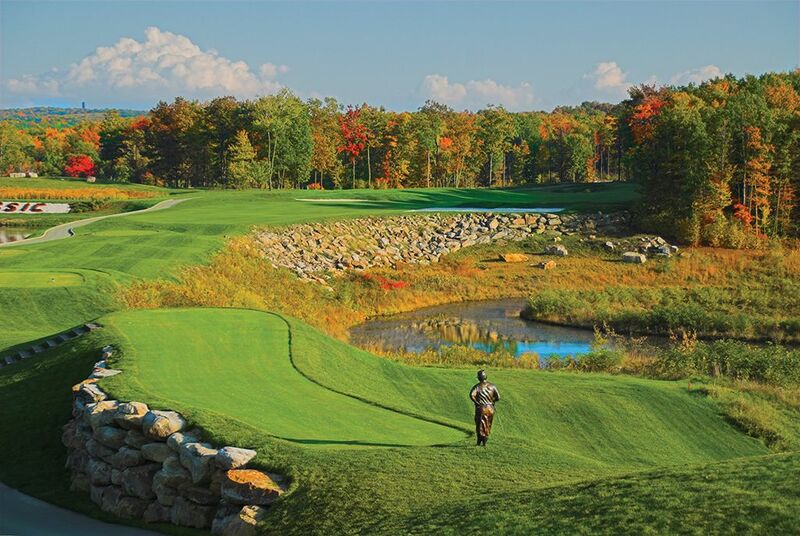 In the end, the more traditional layout and extra bling of Mystic Rock makes it the preference of the two courses at Nemacolin for many visitors. 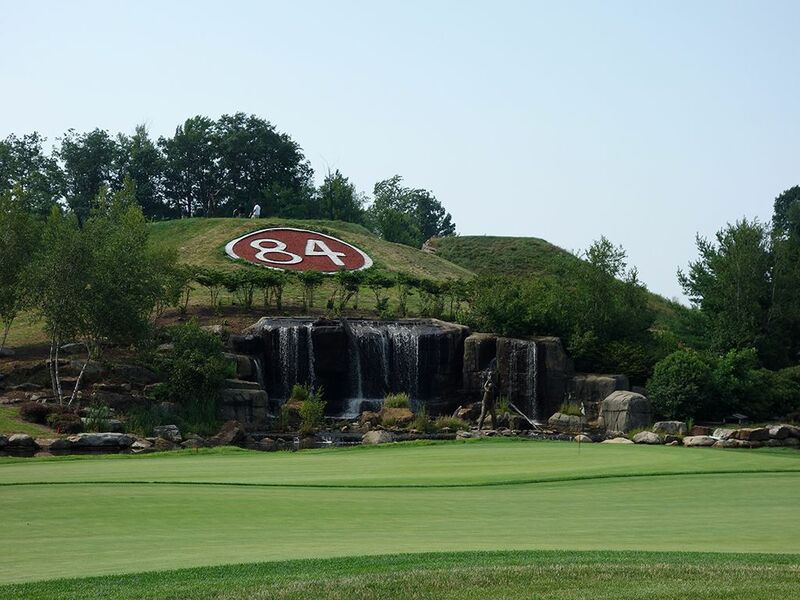 Signature Hole: 5th Hole – 598 Yard Par 5 – Mystic Rock's over-the-top nature is on full display for the 5th hole where this downhiller plays to a green framed on the left side by a waterfall, pond, and John Daly statue sitting under the 84 Lumber logo. From one tee box up, this hole is significantly shortened and becomes much easier to reach in two. On the approach shot for this hole players must decide between which angle of attack they want to come in from as the fairway splits to a high side and a low side. The high side keeps you away from the water that frames the left side but it also leaves you a shallow angle of attack when going after the green. 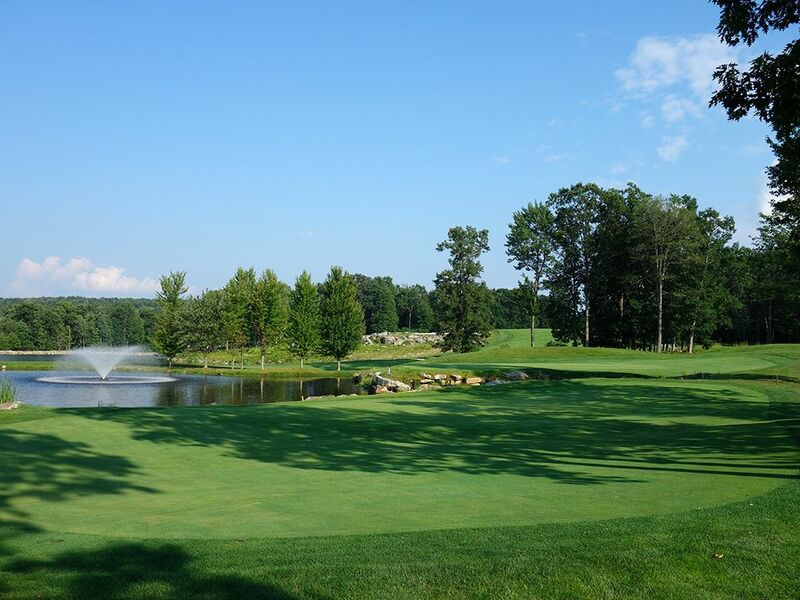 It is an attractive and memorable hole with a fitting tribute to Mr. Hardy's 84 Lumber company that made building the course possible. Best Par 3: 12th Hole – 185 Yards – 12th - 185 yards - Options make great golf holes Dye uses an unique option here by building two greens. Just one green is in play each day, but the option creates multiple angles of attack to enjoy during different rounds which can often be difficult to create on one-shotters. Both greens are built at the back of a pond and a forced carry must to executed to reach either one. A small inlet separates the two putting surfaces and I'm sure it is relatively often the case where the wrong green is hit and a precarious par save scenario is presented. Devoid of any bunkering, it is a fun hole that you'll look forward to playing each time around. 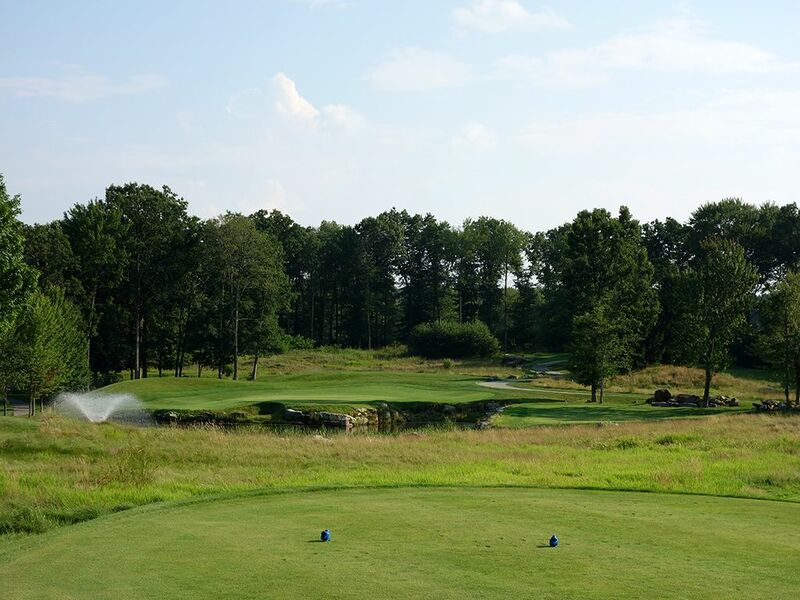 Best Par 4: 2nd Hole – 473 Yards – Not only is the 2nd hole a great design, it is one of the toughest challenges of the day. A Gene Sarazen statue is your lone onlooker as he waits to see if you can navigate away from the two fairway bunkers that pinch the landing zone. The more bold you are off the tee by challenging the larger of the two bunkers, the more the reward on the angle attacking the green. The putting surface is protected by a large bunker on the left which can distract you from the real peril on this hole which is the small pot bunker hidden between the green and large bunker. Ending up in this bunker might as well be a one stroke penalty because getting up and down from there will take Phil Mickelson sauce. 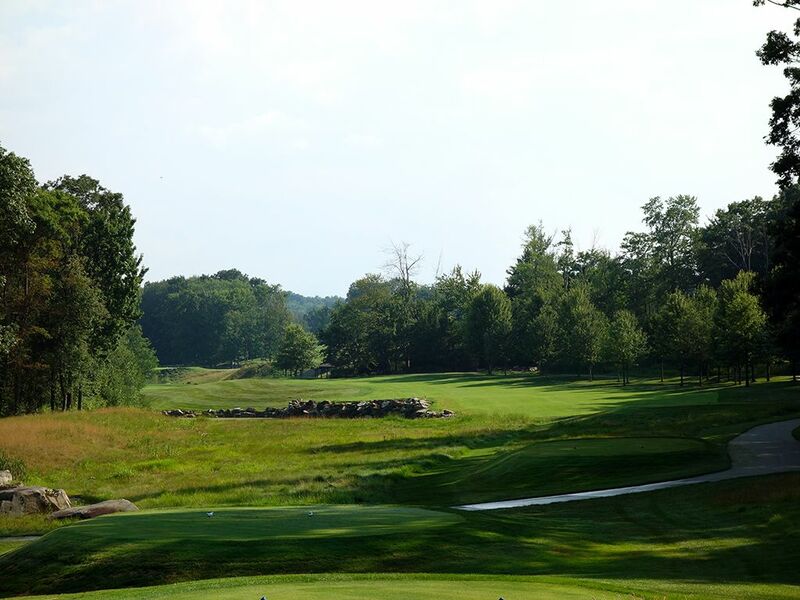 Best Par 5: 11th Hole – 634 Yards – The most dramatic hole at Mystic Rock is this three-shot par five that will tease and impress you from start to finish. The tips are tucked way back and below the fairway and appear to rarely be used as the path to them if not very beaten. The uphill tee shot leaves some mystery as much of the landing area remains out of view for players which can cause uncertainty with your driver, but be assured there is more room available than meets the eye. Upon cresting the fairway, players are afforded a stunning view of a downhill fairway ahead of them and a lake claiming the right side of the hole. With the green bending right in a peninsula fashion towards the water, a risk/reward element comes into play on the approach shot where only the most confident, and long, players will challenge the putting surface in two. Players laying up will allow themselves to go pinseeking on their third shot in an effort to attack any hole location with hopes of walking away with a birdie. The views from the hole are the best on the course. Birdie Time: 13th Hole – 394 Yard Par 4 – I enjoy an unsuspecting hole. Off the tee it looks ordinary and then when your reach your ball for the approach shot the hole unveils an impressive display. 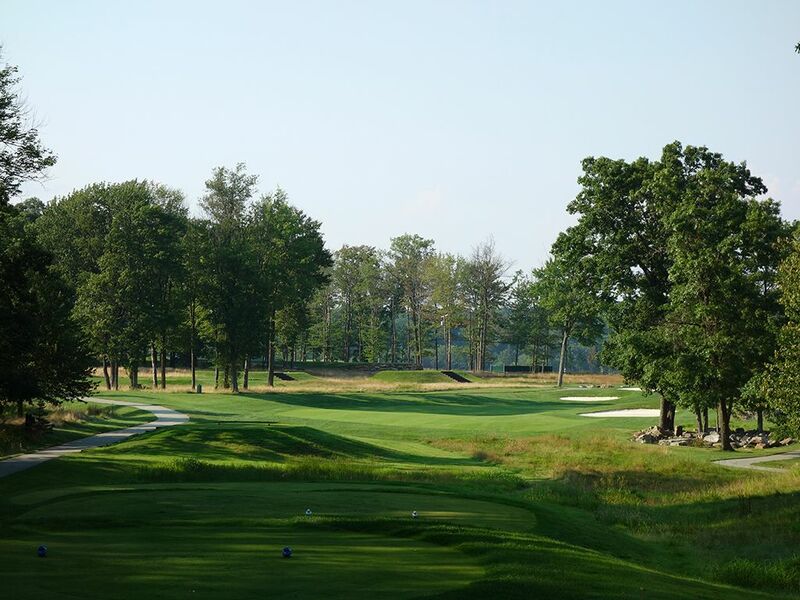 The dogleg right 13th falls into that category as the main view off the tee is a bunker 250 yards in the distance on the right side along with a group of trees blocking the view of the green. 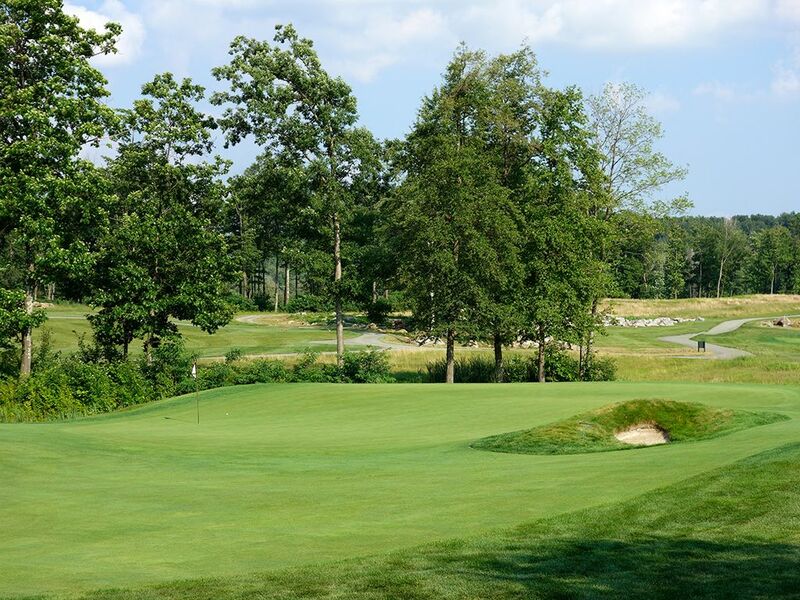 Upon reach the corner of the dogleg, the hole unveils an attractive scene of bunkers, trees, and a raised green wrapped on the side and back with water. 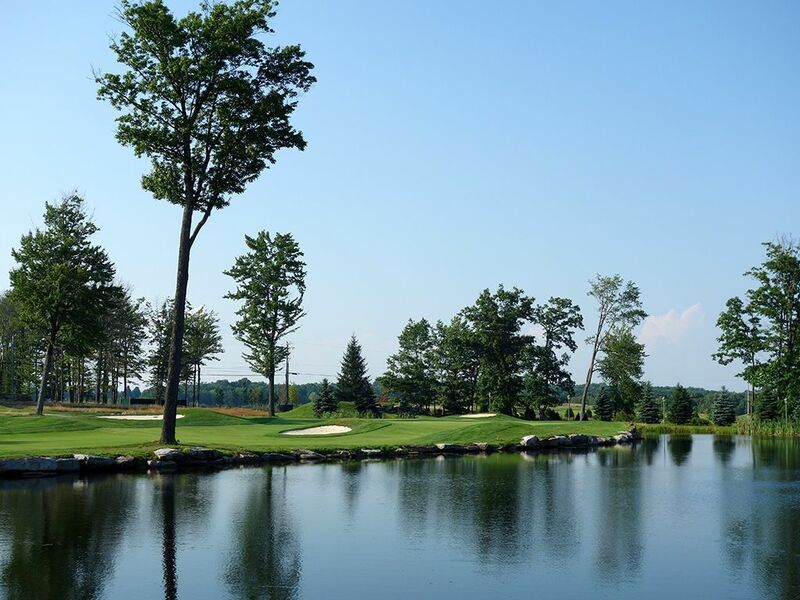 A lone tree on the edge of the pond stands as an iconic figure leading up to the putting surface on the right side. Not very lengthy overall, leaving the driver in the back is a good decision here where accuracy is favored over length so that you set yourself up in good shape for going after the wide but shallow green. Bogey Beware: 9th Hole – 476 Yard Par 4 – The closing hole on the front nine is a worthy test by anyone's standard. 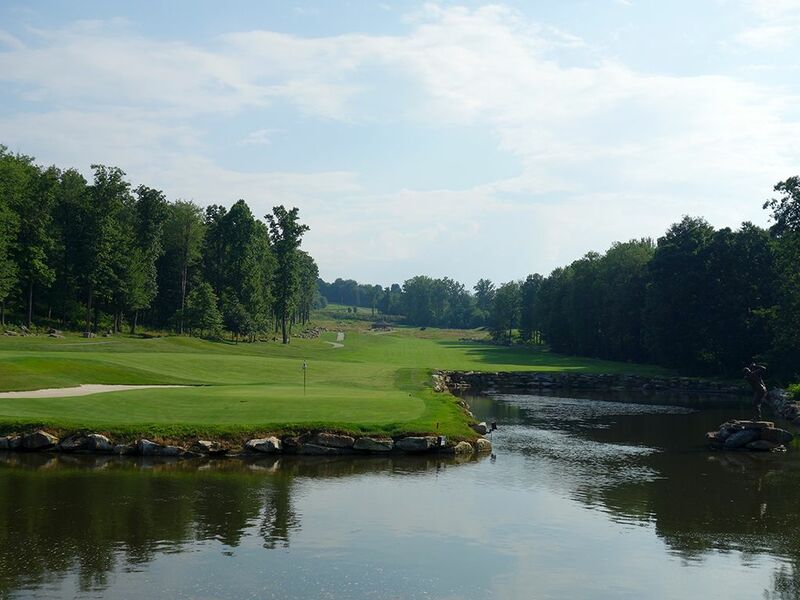 The late left dogleg brings a pond into play on the left side starting 220 yards from the tee. The landing area is just 24 yards wide so length and accuracy will be required on the tee ball before eyeing the approach shot. The green is long and narrow with a skinny bunker breaching the left side and a small, deepish bunker at the front right corner of the putting surface so you'll need to display some finesse around the green as well. This is a stout test that will requires your 'A' game from start to finish to avoid a bogey. As the annual host to the AT&T Byron Nelson Championship on the PGA Tour, patrons have an opportunity to see how the course plays on TV prior to arriving in person. With its proximity to Dallas I expected there to be homes and office buildings in the surrounding area, however what I didnâ€™t expect was the amount of wildlife I encountered during my round. From foxes to turtles to a wide variety of birds, the course manages to maintain some natural feeling in the middle of an urban area.